I hear this on repeat from you—our amazing donors and peacemakers. And if I could leap through the phone and hug you, I would. Because your work is grueling too. You live day-in and day-out in a hurting world while holding onto, and living out, this crazy idea that love can actually remake our world. That work isn’t small. It’s wide and deep. It’s slow and steady. Sometimes it feels a lot like tilling the soil for a harvest that might not arrive until years later. Once in awhile, I hear a donor’s story that leaves me weepy and full-to-the-brim of hope. Suddenly, I felt small as I listened to Alyssa Brady, a teacher at Greenland Central School in New Hampshire explain how she brought Preemptive Love into her classroom. How her students decided to quit talking and start doing. And truthfully, I couldn’t fully understand. My adult brain—the one that often puts fear in the driver’s seat—didn’t fully comprehend how this is possible. How does an entire class of third-grade students hear about Preemptive Love Coalition and agree that not only should they do something about it, but that they absolutely must do something about it? 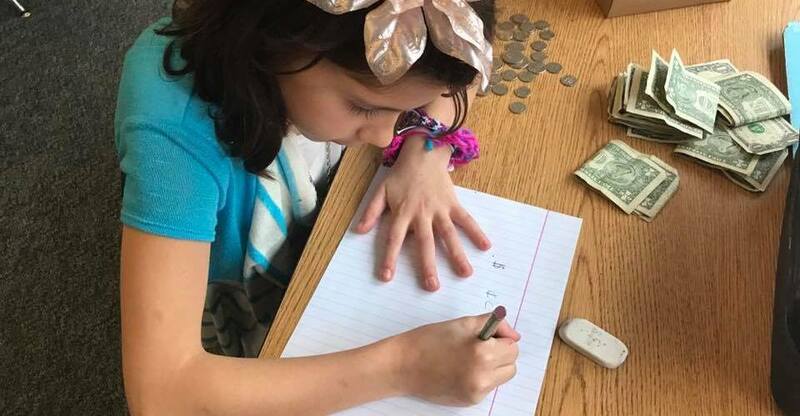 These 8 and 9-year-old kids, full of wonder, possibility, and creativity, decided to host a craft fair where they would sell handmade goods their school community. Many of the children chose to make more than the agreed upon 20 items in hopes of raising more money to help more people. One student knitted scarves, necklaces, and bracelets, and named her business “Fashion for Compassion”. They poured their hearts and souls into making every single piece by hand. And then they gave every penny that they earned to our team so we can transport their love to the hardest places. So we can remind our brothers and sisters in Iraq and Syria that they are seen and loved and deeply cared for. Because at the end of the day, isn’t that what we all crave and deserve—to be reminded that our very existence and humanity matters? Take Preemptive Love into your classrooms and PTA meetings and cooking clubs. Take us to your offices, kitchen tables, and grocery stores. Remember the front line isn’t “out there,” it’s wherever you are. It’s where you work, break bread, and worship. Invite us into your comings and goings. And when you do, you might just find a classroom full of third grader staring back at you, bright-eyed and overflowing with hope. Believing that they can make a difference, that their ideas aren’t small, and that their love can remake our world. Friends, thank you for taking Preemptive Love into the nooks and crannies of your life. We know it isn’t easy, but we believe it’s worth it. We need more of you, not less, if we are going to remake our world. We need your creativity and vision and passion. We need your values and beliefs. We need the differences among us to make something really beautiful, nuanced, and enduring. Remember we are with you and for you – always. We belong to each other. And at the end of the day, love wins. Remake our world with love, starting with your corner of it. Give today.